Yet another month has passed, and another bonsai club meeting. We met in the usual place as we always do and had small enough numbers with 5. 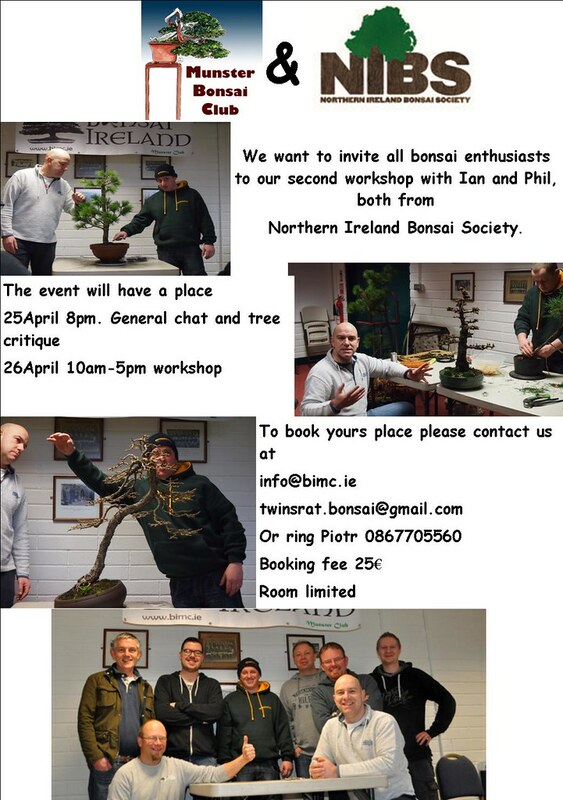 But all in all it didnt matter there was plenty of chat and craic about everything Bonsai. Wading through the rest of the photos now. I’ll be doing the accents as a separate post along with a few other themes for the weekend. Apologies if there are any doubles, I did revisit trees as the light changed in the galleries so some of these might be from the Part 1 post but better light. As I sit here sorting through my photos from the weekend two things are clear to me. First, this was without doubt a top quality Shohin exhibition that any country in the West would be proud to be associated with. Second, I don’t actually think the trees were the best part of the show! I see the other among the tree snaps that have captured the amazing atmosphere at Willowbog Bonsai, a special place. Like minded people doing bonsai how it’s meant to be done. More of these photos at a later time. The final place will let know in short future. Total cost 60-75€ for two days.